One-of-a-kind Ferretti Custom Line 94, the original Owner worked with the Current Captain and implemented British common sense design throughout this yacht, including multiple practical amendments to the original design and fully upgraded systems. A Well-appointed finish throughout, with high quality Cherry wood and cream carpets in the saloon, Master and Guest Cabins. The character of this yacht throughout is elegant and comfortable, as signature Yacht. The Ferretti 94 Custom line was built by the Ferretti Spa shipyard in Italy, a number of implementations were added in build including extended berths layout and arrangement of the bathrooms and cabins. Customisations include upgraded customizations in the helm station include helm seat and Carbon Fibre dash panelling. A Private Yacht since New, the Yacht is now under her second Owner, the current Captain has been with this Yacht from build. The Captain has maintained this boat to the highest standards, with hand long range equipment such as an upgraded water maker and powerful TWIN MTU 2037 HP engines which allows the Ferretti to access top speeds of up to 34 knots. The current condition is fabulous, the Captain has tested the Yacht in a number of trying conditions and there are no mechanical or construction issues to note. The handling and performance are exceptional, with great performance in Bluewater oceans. With a shallow draft the majority of Calas and Marinas are accessible to this first class Yacht. This Ferretti 94 will be handed over in “Turn Key” condition having been fully anti fouled and serviced for the upcoming season. 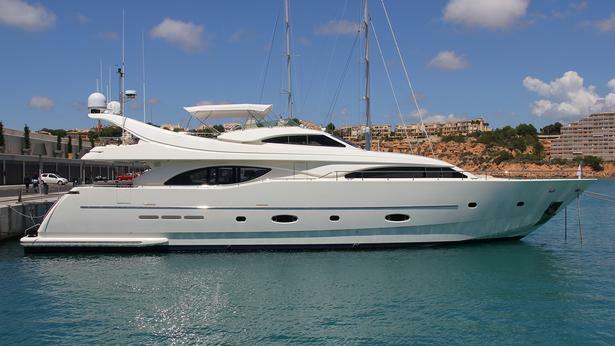 In our opinion she is one of the best presented Ferretti´s on the market. Denison Yacht Sales - Advanced Co-Brokerage 2 is pleased to assist you in the purchase of this vessel. This boat is centrally listed by Marlin Marine Services.